Love this product. The beads are so gentle, you can use this every day. And, the smell is wonderful. A good value as well. Clarins one step exfoliating cleaner for face, mild cleansing with beautiful and fresh feeling after washing your face, pleasant citrus smell. 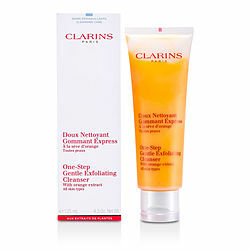 Clarins one step exfoliating cleanser is an item that everyone should purchase. This cleanser is so gentle but effective and I use it everyday in the shower. It has a orange fragrance and will leave your skin radiant and smooth. I'm an Esthetician and have tried several lines but Clarins has the best skin care out there. Give it a try..Love this. I have used this exfoliant for years and love it. I have sensitive skin and it never burned or felt uncomfortable. It is gentle and yet exfoliates well. I use it twice a week and it does the job. Clarins One Step Gentle Exfoliating Cleanser is just wonderful. I am in my 60's and love this product. It leaves my skin very clean and not dry. This is one of my favorite beauty products. I love the discount and free shipping that Fragrancenet offers too!